One of the few shortcomings of the Duke 4 that I’ve discovered in the five months that I’ve had the bike, is the awkward relationship between the footrest and the brake pedal. 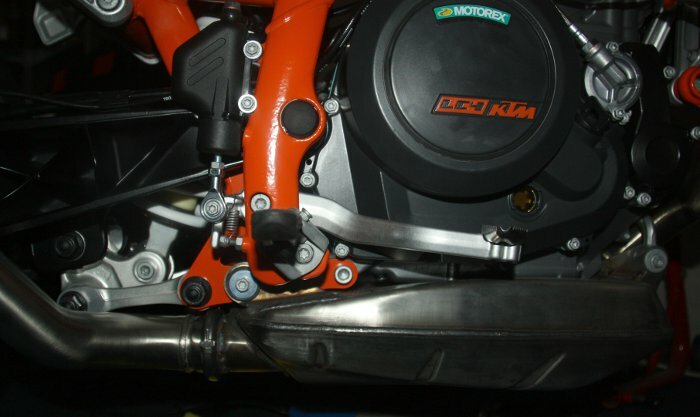 When KTM introduced the Duke 4, one of the changes compared to earlier Dukes was the introduction of a bolt-on footrest support bracket (as opposed to a bracket that was part of the frame) and a less substantial (more road and less motard) design of footrest. I presume that the main reason for the change was a cost saving although there may have been some style considerations as well. The change has not however been a success. 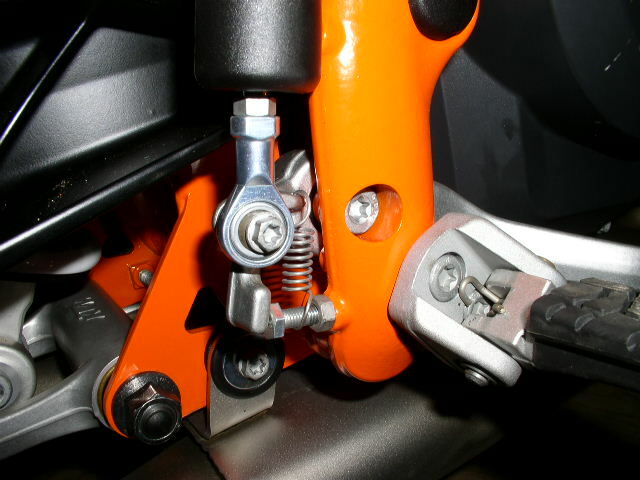 The Duke 3 and earlier brake pedal has been retained, whilst the new bracket does not seem to have been designed properly so that the footrest sits too low in relation to the brake pedal. 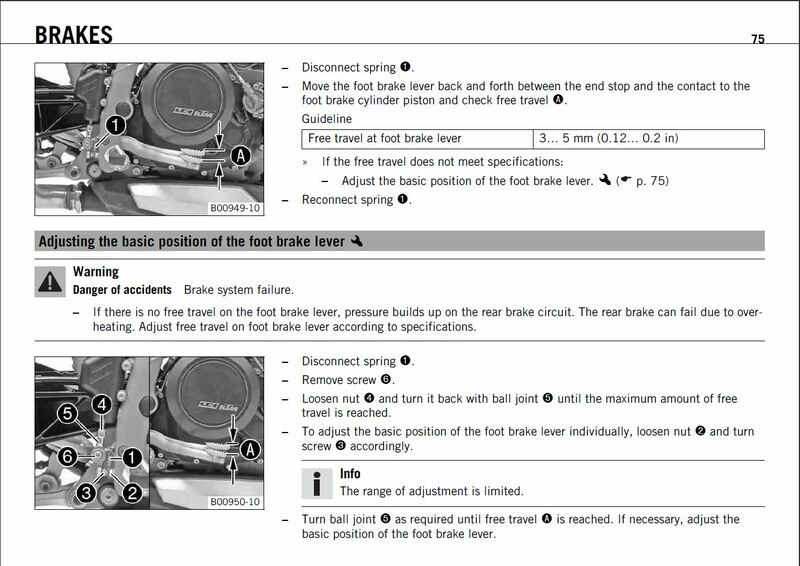 This, in turn, means that for an initial application of the brake, you either have to flex your foot at an unnatural angle, or as I do, take your foot completely off the footrest. 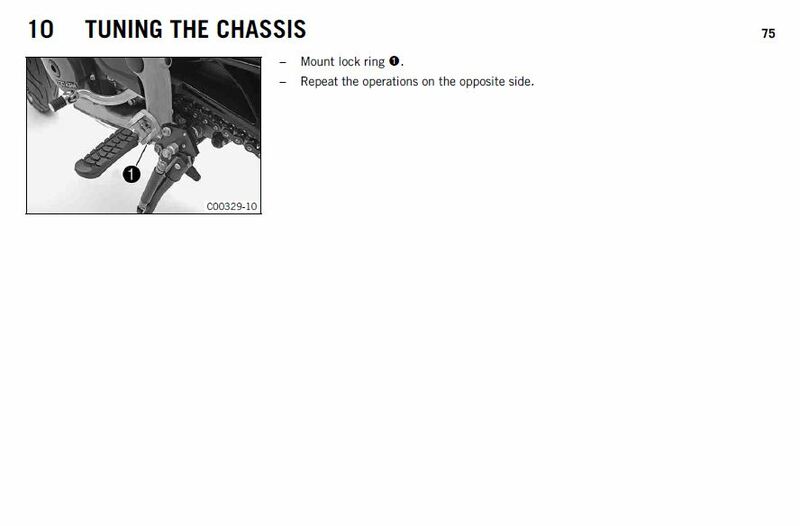 The pedal position can be adjusted somewhat and this is described on page 75 and 76 of the 2012 owners’ manual. 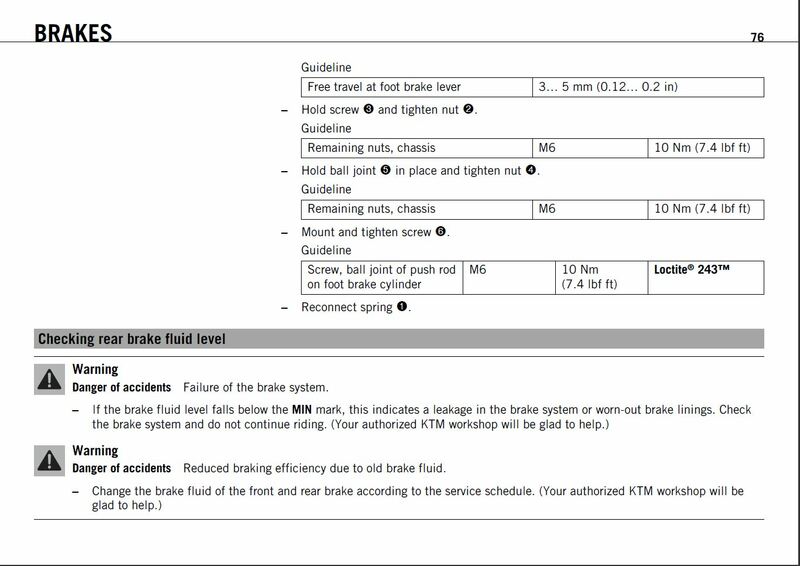 The manual itself points out that the range of adjustment is limited and according to correspondents on the Dutch motor-forum.nl site (discussion starts round about here) not sufficient to deal with the issue described above. An early suggestion from the motor-forum site to deal with this issue, was to increase the pedal adjustment range by shortening (by grinding down) the master cylinder pressure rod (item #14 in drawing below) and replacing the pedal adjusting bolt (# 12 below) with a longer one. This seemed to me to be a rather extreme way of dealing with the issue, so when correspondent on motor-forum, RaptorRVL suggested rotating the footrest mount bracket by 180° (which would both raise and move the footrest back by about 2 cm) this seemed like the ideal solution. Being of a cautious disposition, I decided to approach KTM SA for the green light to carry out the modification. 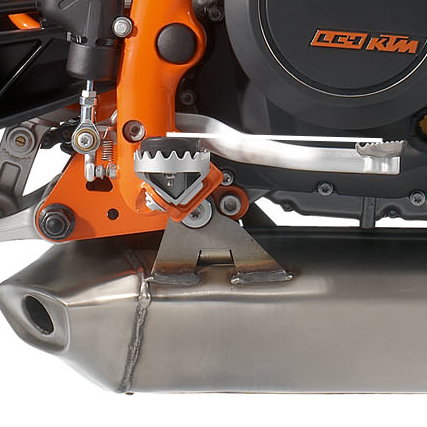 After an exchange of e-mail I eventually received a reply that “to change the way that the foot rest bracket is fitted is not recommended by KTM and doing this will affect the safety of the motorcycle”. I then decided to let Alfie Cox Racing adjust the pedal during the 1000km service, which was carried out last week. 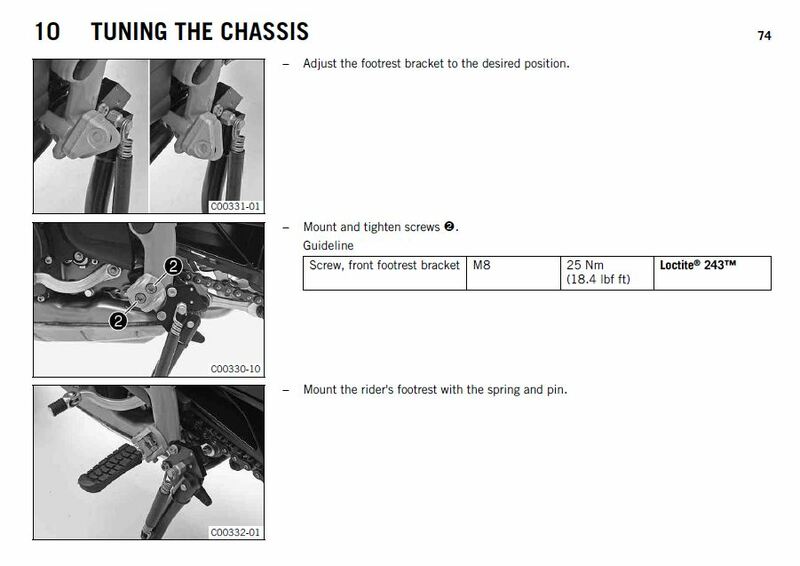 There is no doubt that the adjusted pedal position is a huge improvement on the way it came out of the factory, but, as expected, the adjustment range was not sufficient to resolve the problem. 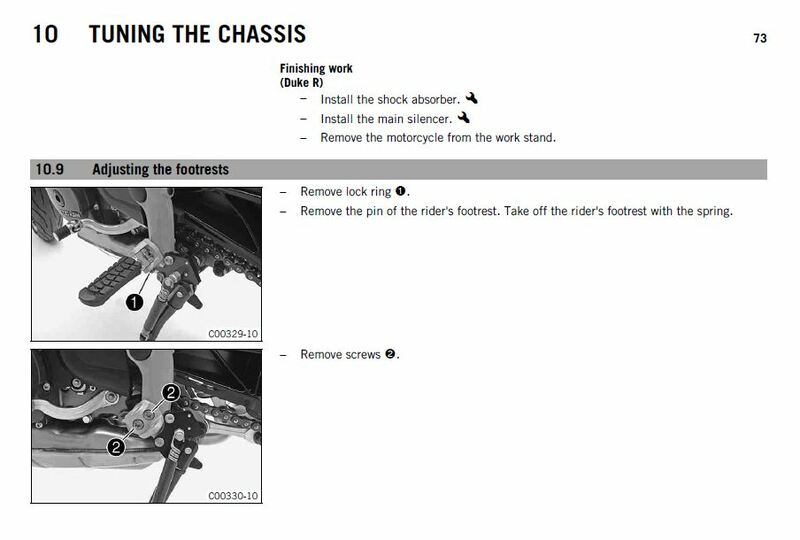 Then, quite by accident, whilst looking at the 2013 owners manual (which covers the ‘standard’ Duke as well as the R version), I found at pages 73 – 75, under the heading ‘10.9 – Adjusting the footrests’, exactly the procedure described above which rotates the footrest bracket by 180º. 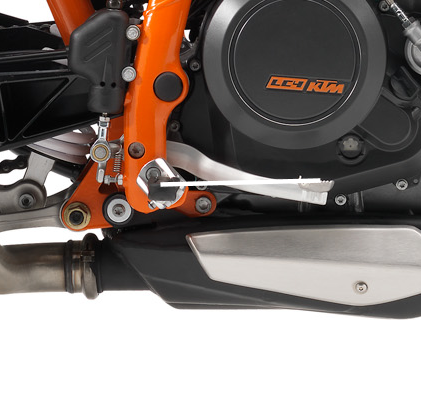 As you might imagine, I’m alternately mildly bemused and irritated by another instance of KTM miscommunication (the first was about the rear axle bobbin issue described in an earlier post). I don’t know where the miscommunication occurs but it seems as if ultimately Mattighofen must take the blame. The factory is clearly not letting distributors and dealers know about problems that arise and how they are being resolved. I suspect that at the factory itself, the ‘right hand does not always know what the left hand is doing’. And that is a great pity – KTM make great bikes, but seem to suffer somewhat from a product as opposed to a customer orientation – that in turn dulls the shine that comes with owning a KTM. 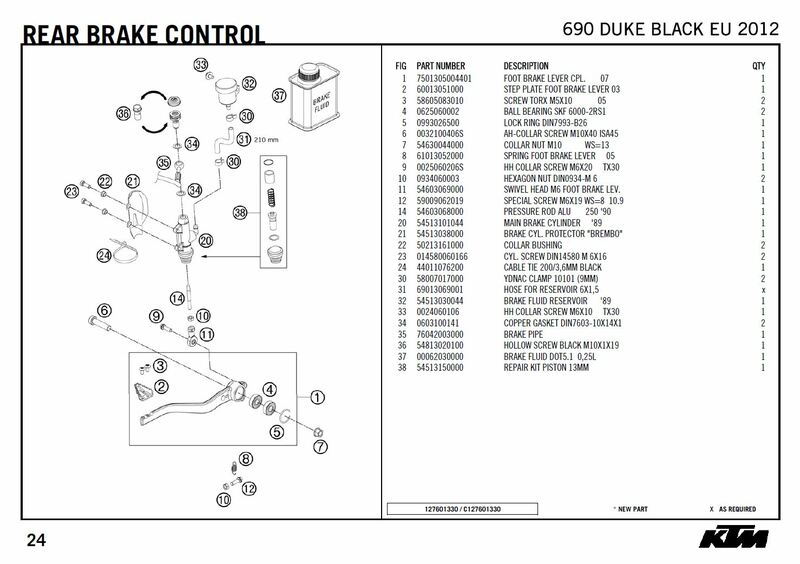 Posted in Technical.Tagged Duke 4 adjusting the footrest position, Duke 4 brake pedal too high, Duke 4 footrest position.